YourConnect Review 2019: Is YourConnect a Good Hosting? 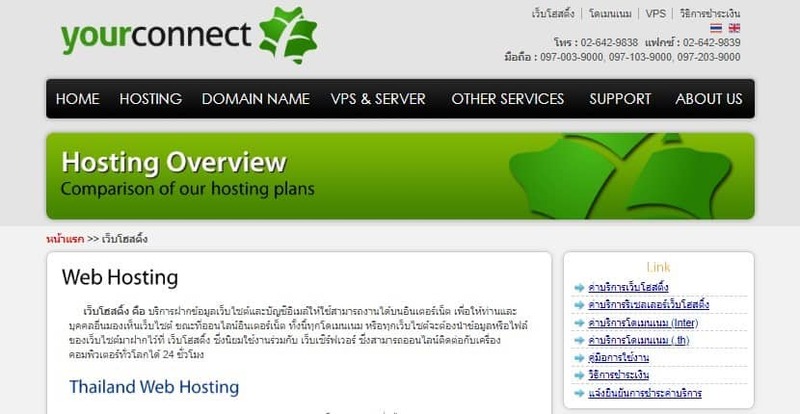 Established in 2003, YourConnect is a web hosting company that provides hosting solutions to Thailand-based businesses. They have an uptime guarantee of 99.95% and their support team has a 24/7 hotline for clients’ hosting emergencies. YourConnect is a Thailand-based web hosting vendor established in 2003. They offer web hosting services such as shared hosting, VPS, clustering server, dedicated server, mail gateway, cloud server, and reseller hosting. YourConnect is in the top 20 biggest hosting companies in Thailand by market share and currently boasts of over 10,000 customers. They also have a significant presence in South Korea and have plans to expand their offerings to Europe and the U.S. The YourConnect website is available in Thai and English. YourConnect hosting solutions are best suited for businesses in Thailand. These packages use Linux operating system powered by CentOS Linux. YourConnect says that they have invested in modern hosting infrastructure and security protocols that protect the systems against incessant downtimes to enhance availability and high performance. They perform daily, weekly, and monthly data backups. These backups are kept for a period of seven days, four weeks, and three months respectively. YourConnect provides email solutions with above average features including the ability to send unlimited emails under the one domain name and up to 180 emails every hour for the subsequent domain names. The YourConnect website is pretty slow to load and has an extremely laggy layout which makes for a bad first impression for those who visit the website. Compared to other vendors in Thailand, YourConnect hosting plans are affordable. While the vendor includes many features, the disk space restrictions are notable: just 512MB for the vendor’s starter package. However, their most expensive shared hosting plan comes with unlimited disk space. YourConnect offers a 30-day money-back guarantee for all of their hosting solutions except for the dedicated servers package. The vendor has an uptime guarantee of 99.95% but this seems pretty ambitious for a hosting vendor whose website takes notably long to load. Customers can contact the YourConnect support team via telephone and email. Alternatively, you can open a ticket. They don’t have a live chat option, but they do have a 24/7 hotline that customers can use to get in touch with the support team in the event of hosting emergencies. The YourConnect knowledge base has pretty inadequate hosting information and is likely to frustrate users who prefer solving hosting issues on their own. That said, information on this vendor’s website suggests that they may have some video tutorials for their customers available through their control panel. The apparent issues with this vendor’s website is their biggest undoing, and negatively affects their brand image in the eyes of potential hosting customers. That said, for those who can overlook this issue, YourConnect seems to have pretty decent hosting offerings that would be suitable for businesses of all sizes in Thailand. Check out YourConnect’s web hosting options today! Wondering how YourConnect stacks up against other Web Hosting companies? Enter any other Web Hosting company and we will give you a side-by-side comparison.